If you take a look at Diploma through the lens of SharePad’s summary page (under the green ‘Financials’ tab), you will find it shares many qualities of a good business. It has raised the dividend every year since 1999, a significant period in the company’s history as we shall see. It has grown turnover, profit, and cash flow pretty consistently. Profit margins are high and stable and the company is very profitable, having lifted return on capital from about 20% a decade or so ago to 25%, typically, in the current decade. Profit is an accounting opinion, but Diploma’s profits are pretty closely matched by less manipulable cash flows. Between 1998 and 2001, Diploma transformed from a group of companies in three unpromising UK-focused industries – electronic component distribution, building products, and steel – into an international group of businesses in three more promising industries – life sciences, seals and controls. Diploma started the transformation by selling ten businesses. It paid some of the money raised by the sales to shareholders and used the remaining £20m to build up five existing subsidiaries that fitted the new mould and to buy more companies. Helpfully, Diploma publishes its acquisition record on its website. 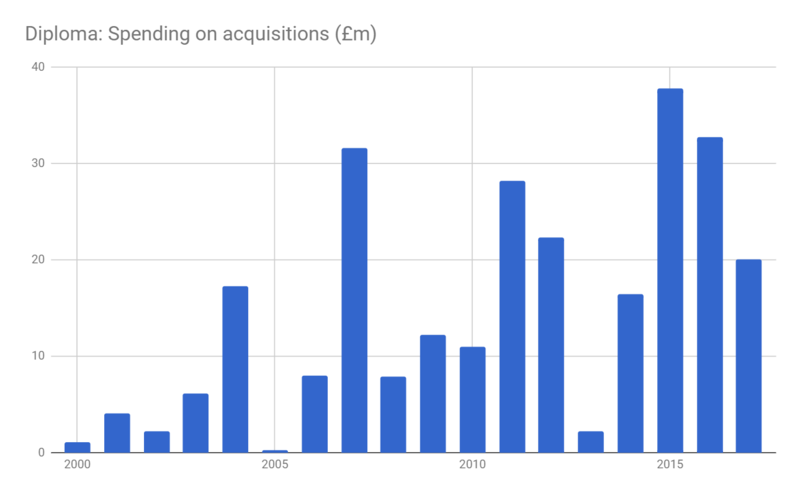 I count 55 acquisitions since 2000, an average of just over three a year, at a cost of £260.1m. Most impressively, Diploma has hardly resorted to external funding. 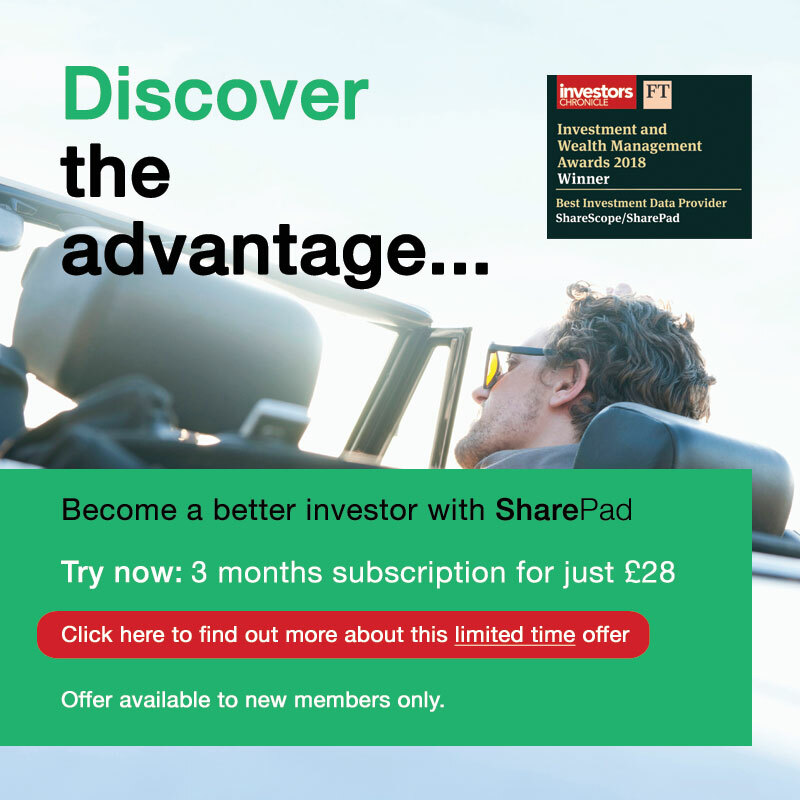 Net borrowing has been negative at every year-end, meaning that at the end of each financial year it has had more cash than debt, and according to SharePad the share count has remained stable, implying it hasn’t raised new money from investors. 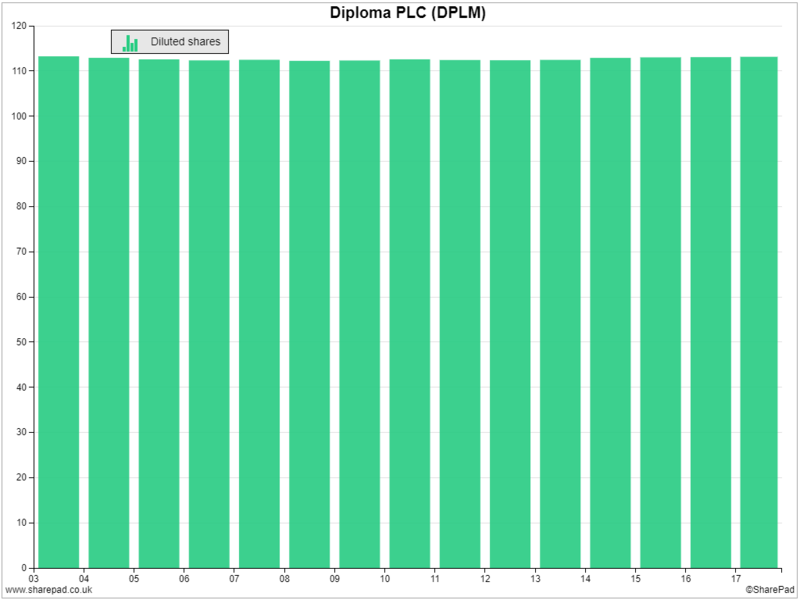 You may wonder why I have bothered including the chart below, since it shows no change at all, but I like it’s monotony! The fact that Diploma has been able to fund acquisitions from the cash prior acquisitions have earned, confirms they were good investments and since revenue has compounded at an average rate of more than 13% a year since 2003, from £78m to 450m, and profit has grown faster, I suppose it’s no surprise that Diploma has a PE ratio to match its status as a growth company. A share price of £12 values the shares at 24 times earnings per share. At that price, Diploma is not an obvious bargain but it may still be a good investment and we may also be able to learn from its success. 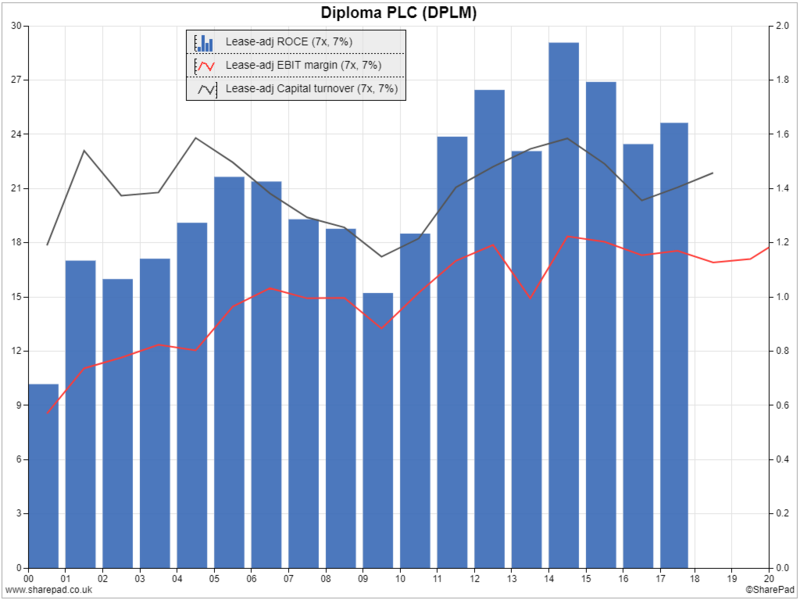 There are other buy and build companies less far along the acquisition trail available at lower valuations. I own shares in Cohort, a defence technology company, and Solid State, which manufactures and distributes electronics. I also have my eye on Judges Scientific which is more buy than buy and build. It buys companies that manufacture scientific instruments. Too often they create the illusion of growth when really they are squandering money on businesses that will never earn enough money to justify the purchase cost. The managers of companies that buy and build must be good at two things: acquiring businesses and ensuring they operate well. Sometimes the challenge and costs of growing existing business and integrating new ones overwhelms them. Buy and builders also present a challenge to investors who prefer to look under the hood of businesses because they are confronted with dozens of hoods to look under and, to murder the metaphor, no workshop manuals to guide them. The annual reports of buy and builders tend to be short on specifics about the subsidiaries. But despite these objections, Diploma has succeeded by encouraging its decentralised subsidiaries to supply specialised products and services routinely required by a range of industries. It’s an easy thing to say, but each of these words makes Diploma’s subsidiaries more valuable to customers. The companies Diploma acquires are specialists and, by dint of their focus, specialists generally provide a better service than generalists. By supplying services as well as products, its subsidiaries routinely collaborate with customers, learning more about what they need. Because Diploma’s products and services are usually routine consumables or components, the subsidiaries become embedded in customers’ operations. By devolving decision-making to the managers of its subsidiaries, it ensures they are entrepreneurial and responsive to customers, which no doubt gives them much job satisfaction. Diploma’s profitability is a financial measure of the value it adds to customers, and the company suggests that relatively few working days lost to sickness (less than 1% a year) and the lengthy average length of service of senior managers (11 years) demonstrates their engagement. There are, perhaps, two flies in the ointment. Diploma’s strategy is the brainchild of chief executive since 1996 Bruce Thompson who will retire by September this year. The company believes its strategy is sustainable and if that is true his successor should have no difficulty following it because it’s so well established. Sustainability is my bigger concern. You can see from the chart of Diploma’s acquisitions that, as Diploma grows, it must increase acquisition spending to maintain its double-digit growth rate, which means buying bigger businesses or more smaller ones. To manage increasing numbers of fairly autonomous subsidiaries, Diploma has introduced small management teams to ensure clusters of like businesses cooperate, selling each others’ products and purchasing together where they can, for example. There is clearly a balance to be struck between autonomy at the company level and efficiency at the group level, and finding it comes at a cost. Not only do more layers of management increase financial costs, they may also distance the top executives from subsidiaries. There’s no sign of damage yet and the archetypal buy and build business is Berkshire Hathaway, Warren Buffett’s investment vehicle, which is humungous. Halma, a UK-listed firm with different products and services but a remarkably similar strategy, is still growing and it earns more than twice as much revenue as Diploma. We shouldn’t be put off buy and build companies because acquisitions sometimes destroy value. Most turnarounds don’t turn and high levels of profitability rarely persist, yet investors still make money from turnarounds and the stalwarts that do deliver year-in, year-out for decades. Investing is often about finding the exceptions that prove the rule, and Diploma could be one of those.